surgeon at the Soldiers Home in Sawtelle with a particular interest in lichens." The VA Hospital in West Los Angeles began its legacy as the National Soldiers Home more than 100 years ago in 1890. As disabled veterans of the Civil War became eldery it became clear to society that they needed a home, so Senator Jones helped purchase the site of nearly 600 acres for them in 1890. A physician was assigned to National Soldiers Home and he resided in the adjacent community of Sawtelle. The name of the doctor was Herman Hasse. He was noted particularly as a surgeon. He was a socially responsible physician for taking an assignment to assist veterans in need during the rise of the liberal Progressive Era of the 1890s. Interestingly, Dr. Hasse was also an avocational naturalist and explored for items of natural history in the immediate region of his work place and home, namely Sawtelle, West LA, and nearby Santa Monica. He also explored the Santa Monica Mountains and as time allowed, he explored further abroad in Los Angeles County. For example, he visited one of our two County Channel Islands, namely Santa Catalina. He also explored inland and eastward in Los Angeles County to places such as the San Gabriel River, San Antonio Canon, and the Sierra Madre (now called the San Gabriel Mountains). His particular interest in natural history of Los Angeles was focused on lichens. However, he was also fascinated with native plants in Los Angeles. In particular, he was interested in the native florula of wetlands, namely vernal pools and streams. His articles, notes, and plant collections teach us a great deal about the environmental history of Los Angeles and early geography of our historical landscape. Turning the clock back even further, from 1889 to 1850 (California statehood), the land was privately owned by ranching interests, so it was heavily grazed by livestock (sheep and cattle). These ranchers were european immigrants from the eastern U.S. They ranched the land with the help of Mexican rancheros and Indians. The land was raped and pulverized to dust and hard-packed soil by these european immigrants, thereby increasing erosion from water run-off, but they also impacted wildlife by shooting and poisoning them, killing literally hundreds of squirrels, rabbits, hawks, owls, eagles, and other wild animals. Similarly, native wildflowers were impacted heavily in a negative manner. However, even earlier, prior to Statehood into the U.S., the land was part of two Mexican Ranchos that were deeded by Mexico to patriotic soldiers that fought for liberation from Spain, and they were rewarded in the 1820s with ownership. The land was also grazed by livestock during this time period but also by horses, and the these grazers were last abundant and damaging to land, although there was still damage to wildlife and wildlfowers, as well as to soils and erosion by water on exposed soils. Even earlier than that, for thousands of years, the land here was hunted and gathered by the First Peoples of America, often called Native Americans. These humans even had impacts on the wildlife but it was not as noticeable because there numbers were fewer. If we go back far enough in time, these First Peoples hunted and gathered here while the Mammoth, Mastodon, Dire Wolf, and Sabre-toothed Cats roamed amongst them. We know this because the La Brea Tar Pits are only a few miles away on Wilshire Boulevard. These First Peoples through intense scientific research are now believed to have contributed to the demise of this beautifully wild megafauna of North America. Overlapping all this human history, there was a vibrant natural history and there is today at the VA Hospital. For example, my surveys in 2005 have discovered that there are many kinds of butterflies, birds, rodents (squirrels) and several native plants thrivin at the historic National Soldiers Home, now called the VA Hospital. Until this report, no one had investigated the natural history, environmental history, and cultural history at the VA Hospital. Although there are fragmentary accounts of American History, there is no mention of Dr. Herman Hasse as the resident physician of National Soldiers Home at Sawtelle. It would seem that it is time that this uniquely significant landscape, both from a historical and natural standpoint be described as a very special "geography of hope." Since this land is located in a densely urbanized region, it is idea to be considered as a Park for nature, history, and culture. We need to consider the VA Hospital to be designated as a "National Historic Park" managed by the National Park Service. This piece of land is invaluable as a national treasure with its natural resources and cultural resources, deserving protection and preservation in perpetuity. It is a Park to be used also for public health, safety, recreation, and enjoyment by the masses of our urbanized citizenry of Los Angeles, but also nationally by visitors and tourists because this land is federally owned. In its pristine natural state, National Soldiers Home was a mixture of vernal pools, prairie meadows, and Walnut Woodland, with perhaps a smattering of Coastal Sage Scrub. Amongst these plants communities, thrived an abundance of animal life. Some of these animals that lived here are now on the endangered species list and others have become rare with nearly no protection yet from any government agency. Other animals, still here today, but becoming increasingly rare in Los Angeles, are no less important, and worthy of protection and preservation. We are able to piece this story of nature and environmental degradation in Los Angeles at Soldier's Home in historic Sawtelle by reading again classic natural history articles written by a medical doctor, named Herman Hasse, who was stationed at the National Soldiers Home during the 1890s until about 1917. The hospital and his home was located at Sawtelle, the name of the community there, which today is memorialized in the street of that name. Currently, in 2005, Sawtelle Avenue abuts the south entrance to the Veterans Administration property. Herman Hasse's avocation was natural history, particularly lichens and native plants. He collected lichens as natural history items, then catalogued them, and wrote about them in articles published in scientific publications. He wrote about his findings from his home at Sawtelle and medical office at Soldiers Home. "The slender stems creep on the surface of the mud bottoms, forming a close carpet, and are submerged when the pools are full. They were now beginning to wither, and were without flowers, but the black fruits were abundant. These are buried in the mud, a character not noted by Morong, and which classes this species with C. sepula Wats. and C. nuttallii Torr. So far as I am aware the present species is known only from the type station, but a Callitriche collected by Hasse in pools near Santa Monica is probably the same." In 1901, another important scientist named LeRoy Abrams visited Herman Hasse at Sawtelle's Soldiers Home (VA Hospital). Dr. LeRoy Abrams was a botanist and student at Stanford and later became a professor there. He collected plants at Soldiers Home which today are curated at the California Academy of Sciences. Abrams' field notes and plant specimens are now invaluable not only for environmental history and understanding the original natural vegetation but for an awareness of genuine restoration potential at the Veterans Administration Hospital in West Los Angeles. Finally, in the 21st Century, in 2005, Audubon birdwatchers are recording their observations at the West LA Veterans Hospital grounds and posting their findings on the internet. For example, an Eastern Kingbird was recorded in 2005. In addition, I have been making field observations of birds, butterflies, mammals, trees, and wildflowers for the last several years at the West LA Veterans Hospital grounds. Lastly, the annual Audubon Christmas Bird Count has visited the VA Hospital grounds for many years too. Before this investigation, there was no report or knowledgeable literature that the V.A. Hospital lands have several vibrant ecosystems and habitats, both historically and in the present 21st Century. The natural history, particularly its fauna and flora was unknown. Now we know that falcons, hawks, rare migrant songbirds, and prairie mammals reside on the grounds of the VA Hospital. Some of these animals and plants are currently considered rare and endangered by the state of California and the U.S. Government. For example, as a result of my survey in July, 2005, it is reported that there is a remnant Walnut Woodland community composed of 7 healthy California Walnut Trees and 11 Laurel Sumac Trees, which totals 18 trees. This community is in urgent need of restoration, primarily by expansion of the area and discontinuing mowing and weeding activities at this location, which prevents new and young walnut trees from growing up. The Walnut Woodland of Los Angeles and southern California is considered by science as an imperiled ecosystem. In addition, the Los Angeles Prairie, which is all but vanished and very rare in Los Angeles today, was once vibrant and vast and formed vast plains (called llanos in Spanish). Today, science lists this ecosystem of the Los Angeles Prairie as even more rare than wetland ecosystems. In fact, wetlands and prairies were often juxtaposed as at estuaries, lagoons, and vernal pools. Today, in 2005, the Los Angeles Prairie is found as only small remnants, or fragments, which until World War II were still widespread and vigrant, and the VA Hospital has one of the last examples of this ecosystem. There is a real and genuine opportunity to restore a nice example of Los Angeles Prairie, vernal pools, and walnut woodland as a mosaic, or natural quilt, if you will, on a portion of the VA Hospital grounds. A few other areas aside from the VA Hospital where the Los Angeles Prairie exists as small fragmented remnants are at some cemetaries, roadside edges, parks, baseball fields, airport, and vacant lots. However, none of these other sites alone or combined are as good as the VA Hospital. One of the best ways to recognize the tell-tale signs of a Los Angeles Prairie are the presence of soil diggings by rodents, particularly the California Ground Squirrels and secondarily by the Pocket Gopher. A hawk flying overhead in a circular glide and swooping down on its prey, such as a squirrel or gopher, lends support to the fact that there is a remnant prairie ecosystem still operating. Another good way is to look for certain wildflowers that are persisting in these remnant fragments as defacto relicts in an otherwise urban jungle of asphalt, trees, lawns, and buildings. These wildflowers are an indicator, just as the squirrel and gopher, of a former prairie meadow. The remnant prairie meadows at the VA Hospital in West Los Angeles, formerly National Soldies Home at Sawtelle, is such a place with indicator wildflowers, gophers, and squirrels. The National Soldiers Home is historic and a very special place. The discovery that butterflies and birds also visit the prairie meadows and woodlands at the West LA Veterans Hospital was a pleasant surprise of this investigation too. Here is an example of a web page to select for a photograph of a Skipper Butterfly which is common to prairie meadows near the coast of Los Angeles in Playa del Rey, not unlike some of the Skipper Butterflies that can be found at Soldier's Home today, in 2005. "Geog. note. - Throughout cismontane California at low altitudes Eremocarpus setigerus is one of the most common and widely distributed plants of the dry open plains and foothills during the rainless season. On the undulating plain on the east side of the Great Valley, between the alluvial floor and the first foothills, it is more common, during the dry period, than any other species. For hundreds of miles these tiny plants, 1/2 to 1 or 2 inches high, forming a rosette of leaves on teh round with a small central cluster of flowers, dot the rolling gravelly plain and often, in July, represent over extensive areas almost the only living vegetation. Or again in looser or richer soil the plants enlarge in size to low mounds a few inches high or 1/2 to 1 1/2 feet across. Wherever there is summer fallow cultivation of the soil the Turkey Mullein becomes an impressive plant, flourishes extremely and adapts itself well to broken ground. Undoubtedly its natural range has been much extended by sheep, whence the folk name of Sheep Weed... The California Indians used the heavy-scented herbage of this plant to stupefy fish in small streams in order that they might be caught by hand, whence the Spanish-Californian name, Yerba del Pescado. The seeds form an important resource for foraging turkeys and are also eaten by Mourning-Doves. The Turkey Mullein is also known to the folk as Stickweed and Flannel Weed." References Cited Barnhart, John H. 1965. Biographical notes upon botanists. 3 vol. G. K. Hall and Co., Boston, MA: 1:563p. ; 2:549 p.; 3:545 p.
Mathias, Mildred. 1989. The fascinating history of Early Botanical Exploration and Investigations in Southern California. Aliso 12:407-433. Parish, Samuel. 1917. The Red Hills Pools. Bull. South. Calif. Academy of Sciences 16: 51-52. Raven, Peter and Henry Thompson. 1966. Flora of the Santa Monica Mountains. UCLA Bookstore. 1. Stachys rigida quercetorum. Jepson (1943,p.426) states that it was collected by Herman Hasse at Santa Monica. The taxonomy was different in 1943 as it was then known as S. ajugoides quercetorum. 2. Nama stenocarpum. Raven and Thompson (1966) call this species "rare" with a description of its habitat as "wet heavy soil." They go on to state that is found only at Sawtelle. The quintessential proof in the scientific literature that Herman Hasse collected this species in a vernal pool at Sawtelle is by the following quote from Jepson (1943): "Soldiers Home, Sawtelle, Hasse." In addition, Jepson gave this obligate wetland species its vernacular-common name as "Mud Nama." 3. Najas flexilis. Raven and Thompson (1966) state: “Shallow water, Sawtelle, Santa Monica, Hasse in 1890 (DS)." This specimen collected over 100 years ago by Herman Hasse is vouchered at the California Academy of Sciences in San Francisco. 4. Githopsis specularoides. Davidson (1923,p.346) reports it collected at Soldiers Home in wet place. I note that Davidson indicates it is found at only that location in Los Angeles County, which is an indication of it rarity. 5. Carex hassei. Jepson (1922, 1:228) states that Herman Hasse collected this sedge on the San Gabriel River. Jepson also states that the type locality is San Antonio canon, as published by Bailey (1896) in Botanical Gazette, 21:5. 6. 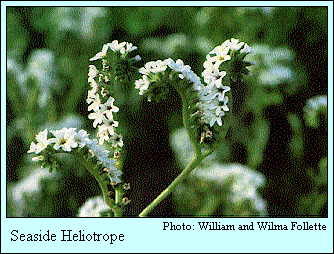 Lepidium latipes. Hitchcock (1936,p.297,Madrono 3:265-320) states the following about this species: “Saline soil and vernal pools at lower elevations ... near Santa Monica.” Hitchcock lists Hasse's specimen at Boston's Harvard University (Gray Herbarium) and another in the New York Botanical Garden. Raven and Thompson (1966) indicate that Herman Hasse collected this plant on "flats near Santa Monica, March 1891." They indicate that a specimen was at Stanford University's Dudley Herbarium but this specimen is now at the California Academy of Sciences Herbarium in San Francisco. Raven and Thompson indicate this species as "Rare." 7. Astragalus tener titi. Raven and Thompson (1966) state that Herman Hasse collected it in March, 1891, near Santa Monica "on vernally moist clay flats." In the second edition, Prigge lists it as still presumed extant. I presume it to be extirpated. 8. Callitriche marginata. Raven and Thompson (1966) state that Herman Hasse collected it from "... drying mud of vernal pools... at Soldier's Home, Santa Monica." They also state that it is rare as of 1966. And Prigge (1986) suggests that it is still rare at Soldier's Home. I have not been able to locate it but my survey in 2005 is not comprehensive enough to state whether it is present or extinct, so it is best to consider it still present and to state that it is presumed extant. 9. Potentilla multijuga. Abrams (1904) states that this species was collected at Ballona by Herman Hasse. He states further to quote his exact words: "Apparently a rare plant not otherwise known." 10. Solanum villosum. Abrams (1904) states that this species was found at Soldiers Home. Interestingly, he does not list Herman Hasse's name adjacent to the species which indicates to me that either Anstruther Davidson, Samuel Parish, or LeRoy Abrams himself collected it at Soldiers Home. It is known that all three of these botanists visited Soldiers Home during this time period of the 1890s to 1904. 11. Solanum rostratum. Abrams (1904) states that this species was found at Soldiers Home. He also states that it was found in Inglewood. And Abrams makes a mention that it is a "native of Texas" apparently to make an association that it may have come directly by some human activity associated with Civil War-related veterans activities transporting it from Texas to southern California. He also states that this species is "ccasional in waste places and along roadsides." It would appear that LeRoy Abrams collected it himself at Soldiers Home, but we cannot rule out the possibility at this time that it was not collected by Anstruther Davidson or Samuel Parish. And of course there is a distinct possibility that Herman Hasse was the collector even though Abrams did not list his name besides the species.